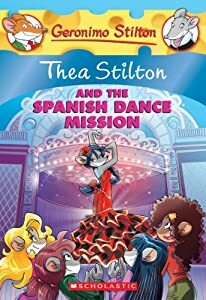 In Thea Stilton and the Spanish Dance Mission join Thea Stilton and the Thea Sisters on this adventure packed with mystery and friendship! The Thea Sisters are visiting friends at a lively festival in Spain. But the theft of a precious fan turns their trip into an investigation! They end up hot on the trail of a secret treasure . . . but they're not the only ones searching for it. Can the mouselets solve the mystery in time? It's a mission full of flamenco dance! My daughter started with Geronimo Stilton books and has continued to like the off-shoots of this series as well, but has not gotten into the Thea Stilton books until now. As we read this together she told me that she liked that the book had a lot of the same characters in it, but was told in a different way and style than the others she read. I would have to agree as I have read the other books with her too, and this is a bit different in a good way. All-in-all this is a fun read, full of mystery and some great dancing as well. If you or your kids like Geronimo Stilton, give Thea a try too, you will love her and the story!